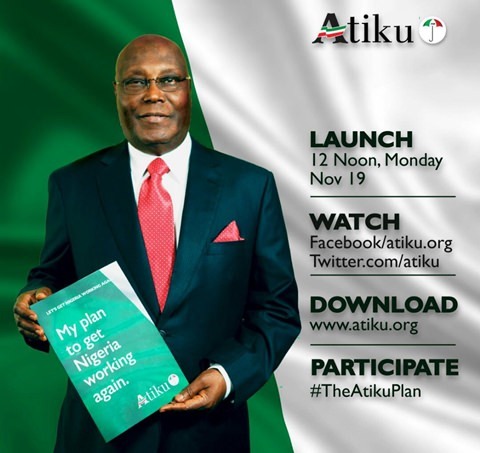 Ahead of next year's general election in Nigeria, the PDP presidential candidate and former vice president, Alhaji Atiku Abubakar, has released his policy document filled with promises. The presidential candidate of the Peoples Democratic Party (PDP) Atiku Abubakar, has promised to create three million jobs every year if he is elected as president in the 2019 election. “Close to 16 million people are unemployed, nine million more than in 2014. “Launch a new, more efficient, cost-effective and sustainable national Entrepreneurship Development and Job Creation Programme. “Create incubation centres, clusters and industrial/commercial hubs to provide a marketplace for MSMEs and SMPs. “Champion the repositioning and streamlining the activities of the existing Federal and State Government Job Creation Agencies”. Furthermore, he stated that he has plans to privatize the Nigerian National Petroleum Corporation (NNPC) and also sell all four national refineries. Other areas of focus in terms of infrastructure is the construction of 5,000 kilometers of roads, and 5,000 kilometers of modern railway. “That is why we want Nigerians to access the policy directly and ultimately take ownership of it,” it said, adding, “Our campaign offers a simple message: United, the people of Nigeria can begin anew, creating a prosperous and secure future and a better life for every Nigerian.